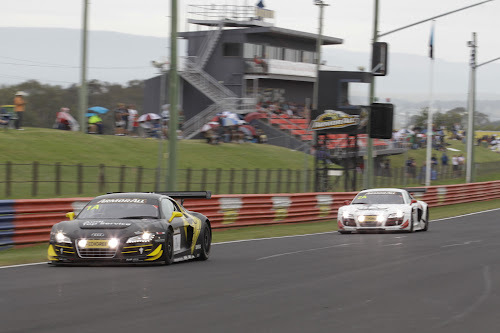 Claiming their second-straight Bathurst 12 Hour win last weekend, Audi Sport remains "King of the Mountain” at Australia's most challenging race and track. Taking the first place win was Christer Jöns, Christopher Mies and Darryl O’Young in the #1 Audi Sport Team Phoenix "Kangaroo" Audi R8 LMS. Despite many weather-related challenges, safety car periods and lead changes, the #1 R8 LMS would prevail with 1 minute 13 second lead over the second place Mercedes. Full report after the jump. 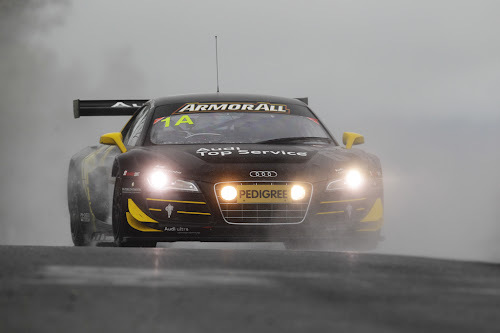 Ingolstadt/Bathurst, February 26, 2012 – The Audi R8 LMS remains "King of the Mountain” at Bathurst. 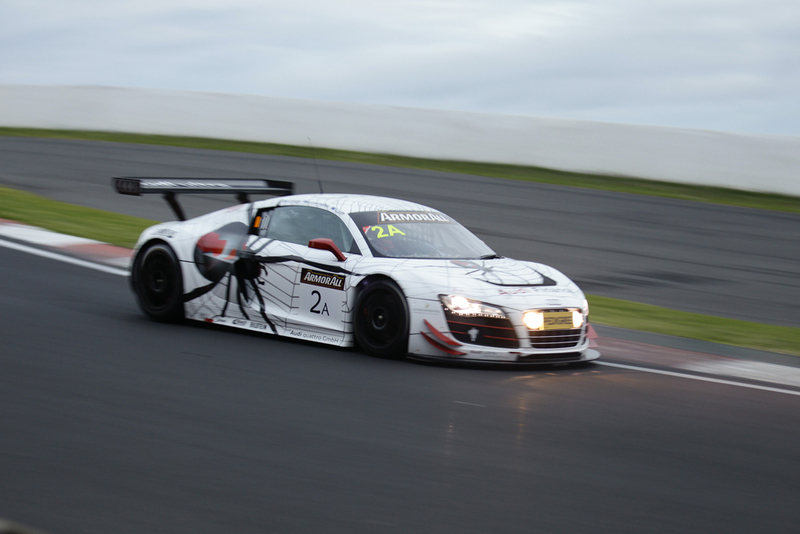 On Australia’s most challenging race track the successful GT3 sports car from Audi Sport customer racing defended its title at the 12-hour race. Christer Jöns (D), Christopher Mies (D) and Darryl O’Young (HK) won the endurance classic at Mount Panorama in extremely difficult conditions. Rain, fog, several lead changes and numerous safety car periods repeatedly interrupted the young trio’s race rhythm. But in the end they won with a 1m 13s advantage. Audi remains unbeaten at Bathurst: For the second time in succession, the R8 LMS prevailed in the most important GT endurance race on the fifth continent. Conditions were far more difficult than they had been a year ago. Varying intensities of rain and dense fog at times caused a number of spins, excursions and yellow periods. The first four hours of the race alone saw the three different vehicles take turns in leading the race. From the fourth hour onward, Phoenix Racing prevailed at the front. Both R8 LMS cars of the squad from Meuspath (Germany) fought a thrilling battle for the top position. 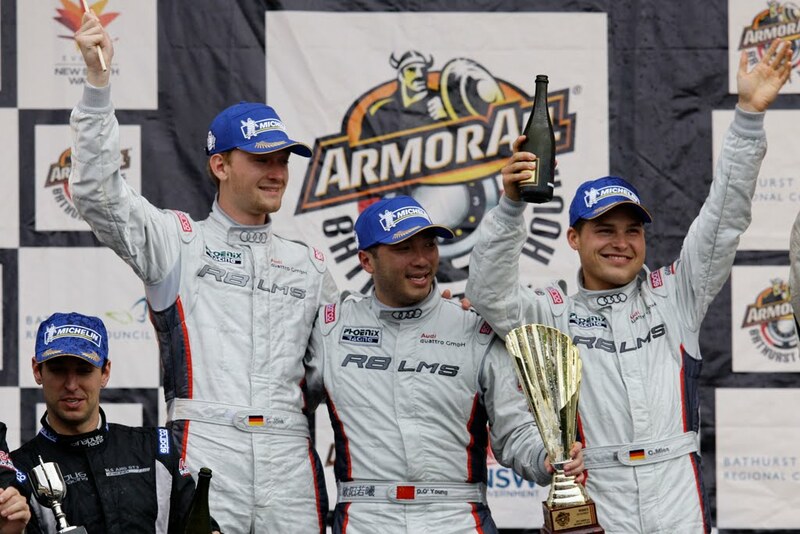 Even a spin and an excursion into the gravel trap that temporarily relegated the black number "1” R8 LMS to third place could not prevent Jöns/Mies/O’Young from taking victory. On Saturday, the trio had already been the measure of all things by setting the fastest time in qualifying and capturing position one on the grid. Victory on Sunday completed a perfect weekend. 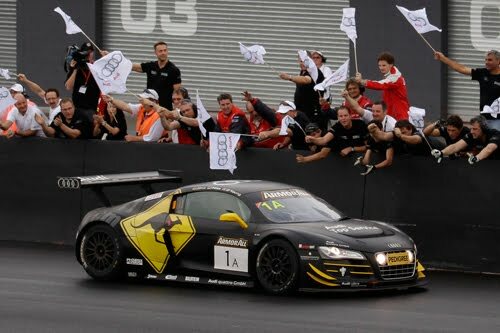 The triumph at Bathurst marked as much as the 119th win in the three-year career of Audi’s successful customer race car. The second Audi R8 LMS from Phoenix Racing was less fortunate. The Australian trio Warren Luff/Craig Lowndes/Mark Eddy had initially shown a strong performance, advancing to the front of the field after having started from fifth place. In the fourth and fifth hour of the race the number "2” R8 LMS was even the leading car. A five-minute time penalty for a severed refueling hose though caused the white Audi to lose four laps at about the race’s mid-point. Afterward, on lap 157, Mark Eddy lost control of his car in dense fog and heavy rain. He crashed into a concrete wall with the left side of the car on "The Dipper” track section. He was forced to retire with front and rear suspension damage. As early as on lap 60 the Audi R8 LMS of Team United Autosports had become victim to the treacherous conditions as well. Frank Yu from Hong Kong spun and damaged the frame of the vehicle on hitting a wall. Neither of the two drivers sustained any injuries. Audi has now won four major endurance races within twelve months, having recorded two successes at the Bathurst 12 Hours and one victory each at the 24-hour races on the Belgian circuits at Spa and Zolder, plus GT3 class victory at the Nürburgring 24 Hours. This year, the 24-hour classics in the Eifel and the Ardennes are again on the R8 LMS’ agenda. The coming weekend will also see the start of the first of numerous GT3 championships in the 2012 season in which Audi customer sport teams are represented. At Adelaide, Australia, Mark Eddy will be competing as the title defender on the first weekend in March. Together with his team-mate Warren Luff he is aiming to make up in the R8 LMS for what he unfortunately was unable to achieve at Bathurst – the leap onto the podium.